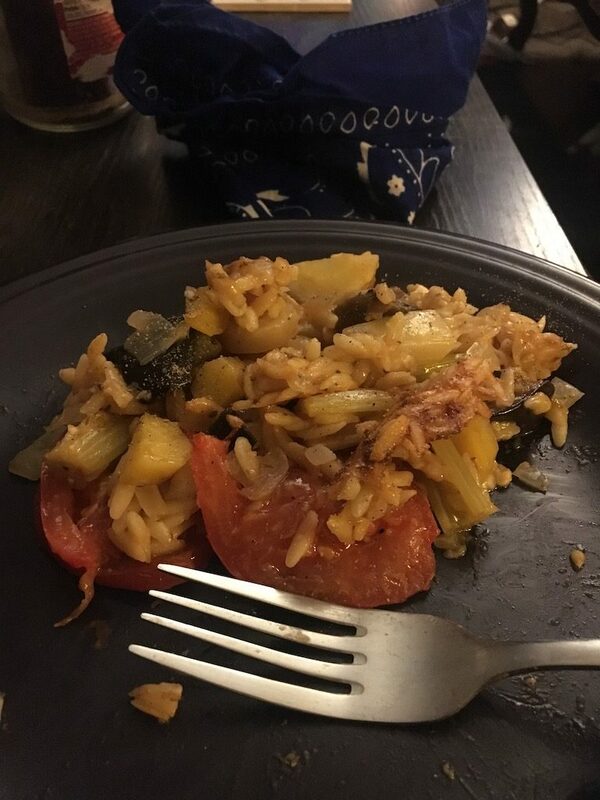 Vegetarian | Gunna Finish That? 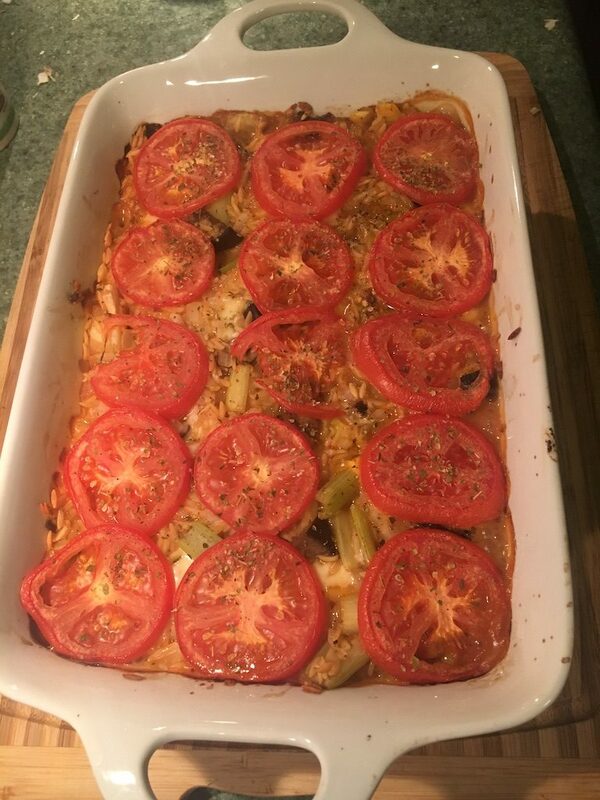 I started this blog with the intention of sharing recipes that I really like from cookbooks that I have but there are rules about sharing methods since they belong to the author of said recipe. You can find the ingredients and instructions on a bunch of other people’s sites or in Yotam Ottolenghi’s book Plenty More. I’ll share with you my experience and pictures and hope that you want to make this yourself. THIS DISH IS AMAZING, relatively easy, and pretty. 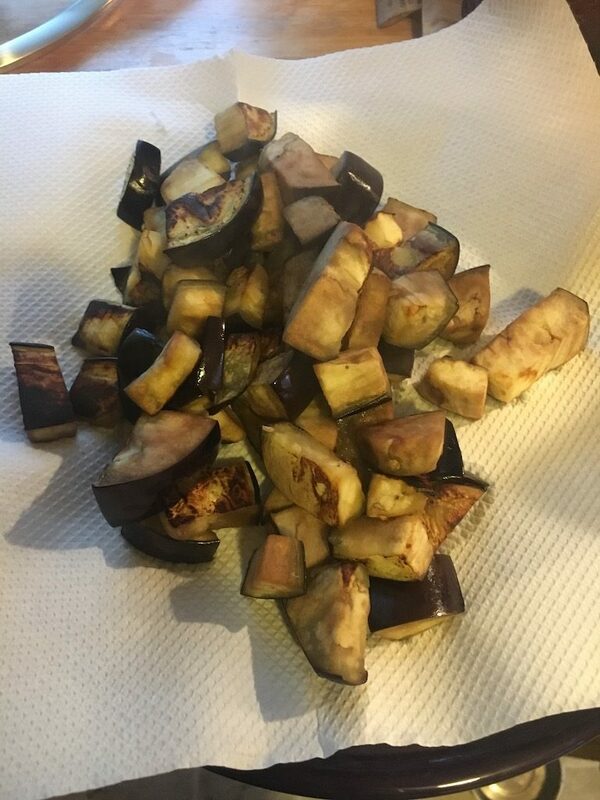 Firstly, Ottolenghi doesn’t tell you to salt the diced eggplant and I have the secret as to why. Female eggplants have more seeds, so the fruit is more bitter (more seeds means a higher likelihood of creating more fruit babies). Salting it draws out the bitterness but it also makes it squishy. If you learn how to select the right eggplant, you can save yourself time and have a tastier dish. It’s also fun to stand in the produce section looking at the bottom of each eggplant while others gaze on, wondering what the heck you’re doing. 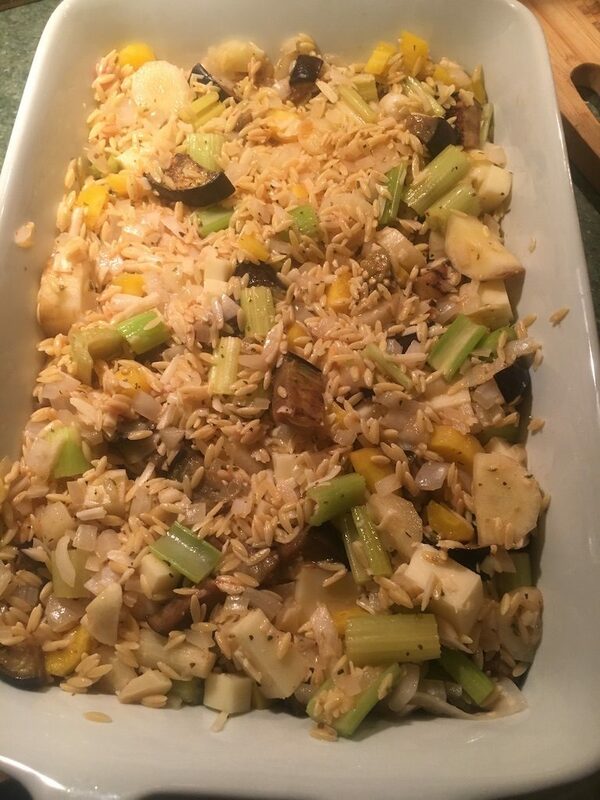 The eggplant takes about eight minutes to cook up, use this time to dice the carrots and celery. 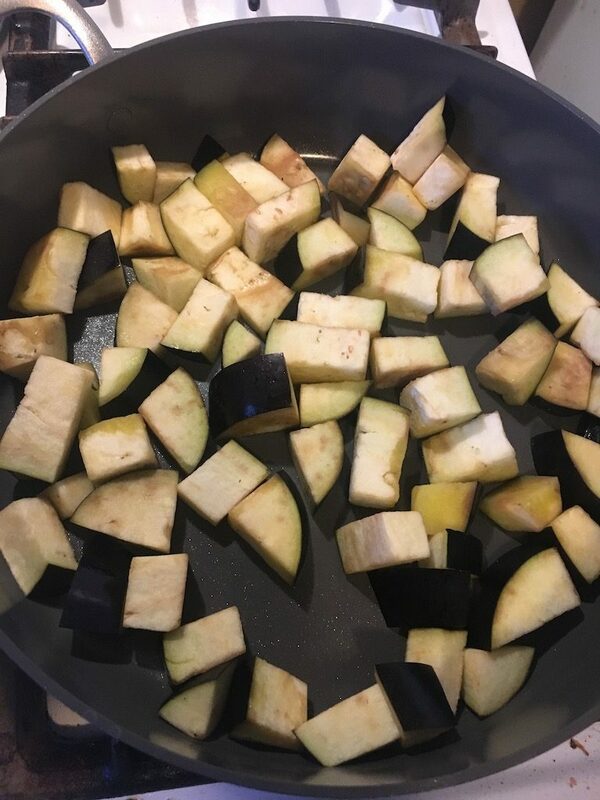 Take the eggplant out of the pan and swap in the celery and carrots. Did I mention that my new pan is amazing? Here’s a trick I employ when tomato paste is involved since I have never come across a recipe that uses an entire 6 oz. can. Get yourself some silicone trays and fill ’em up! 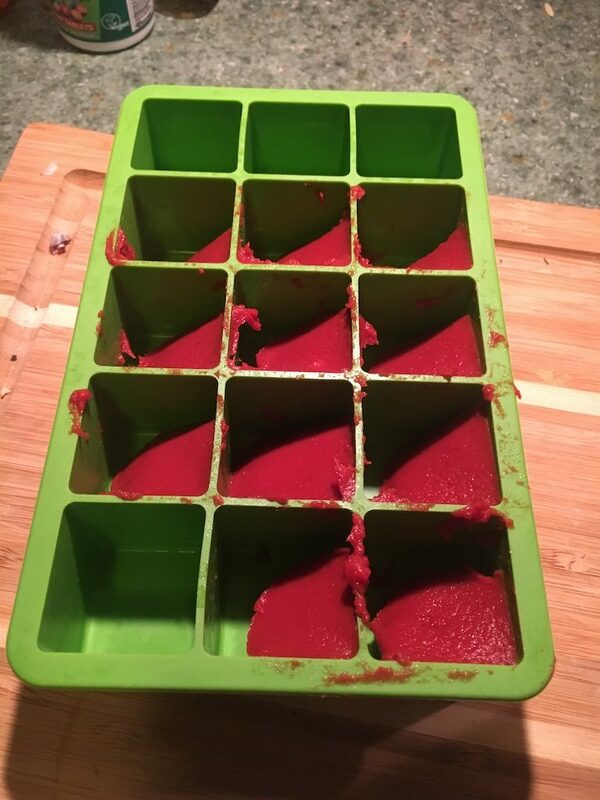 Pop them in the freezer and, when you remember, put them in a freezer baggie for the next time you need one more teaspoon. After the broth and paste are mixed in with the onion, garlic, veggies, and orzo, stir in the cheeses. The recipe calls for cubed mozzarella to be placed throughout the mixture, but we’ve found that this doesn’t distribute well, so we recommend shredding the cheese and mixing it in. 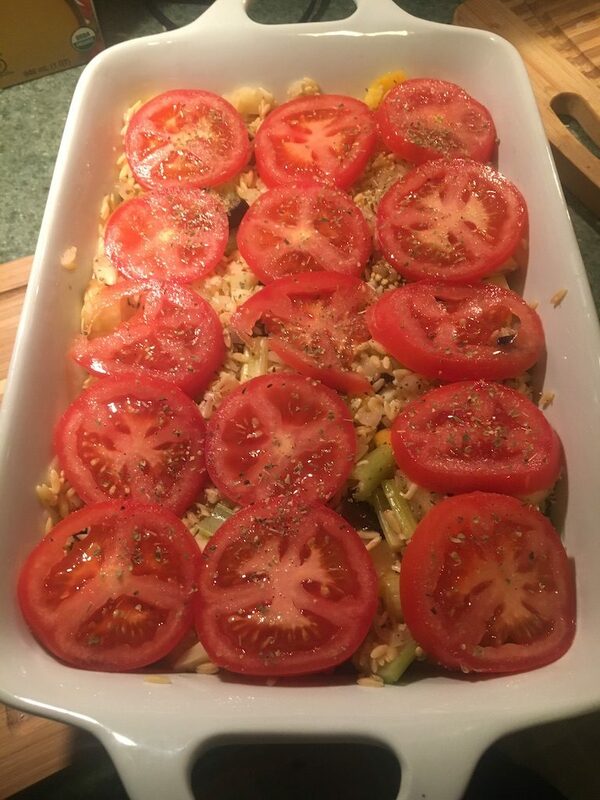 Fill up your favorite casserole dish and top with the sliced tomatoes. The end result was so delicious that I only remembered to grab a picture of my second helping. For the full recipe, use The Googles, or buy/borrow/lease Ottolenghi’s book Plenty More. Breakfast is the most important meal of the day. Though, for me, that only applies to weekends and leisurely days off work. As a result, we take our end-of -fast pretty seriously in this house. The fella is really good at cooking scrambled eggs. We’ve spent the better part of last winter trying to perfect a replicate of the breakfast burrito at Mickey’s Tavern (do yourself a favor and go have brunch on the patio at least once; if you’re lucky, it will be a life-changing experience), and made up a cheesy egg sandwich that will probably get a post on here in the future. 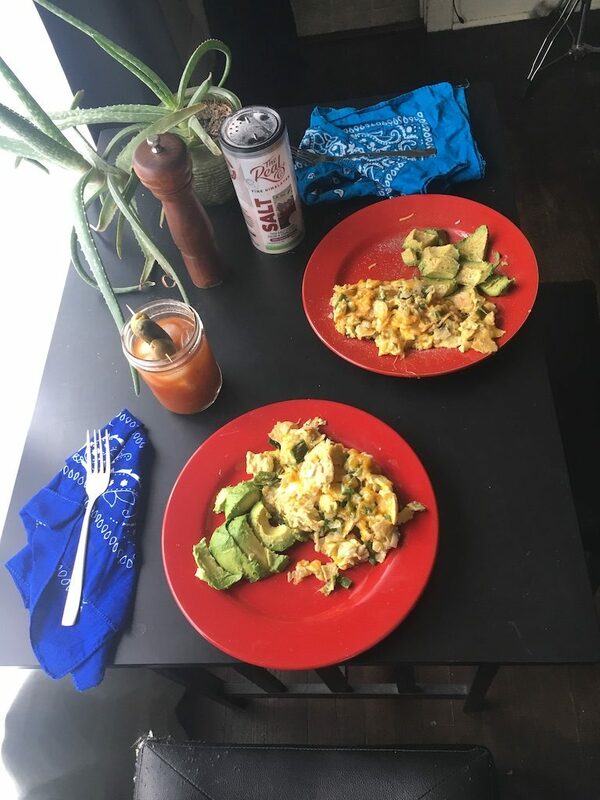 But, a couple of weekends ago, I suggested we try migas because they’re simply divine. And delicious. And really pretty easy to make if you’ve got the egg part down. The first place to start is roasting a poblano pepper over medium heat on your gas stove (you did stipulate that a gas stove was a house-having requirement, right?) until most of the outer skin is charred. I think this takes five to ten minutes per side but it kinda depends on the pepper and your patience. After it’s roasted, you need to put it in a bag (I prefer paper but plastic can also be used) to sweat for about ten minutes; I usually take this opportunity to chop up and start cooking the onion. Speaking of the onion, here’s a cool trick that I learned from the front section of Cook’s Illustrated where readers send in tips to share. Dice the onion; whatever amount you think you like, start your pan over medium heat, and drizzle the lubricant into the pan (I use EVOO or propellant-free Avocado Oil) and place a single piece of onion into some of the oil while the pan is still coldish. 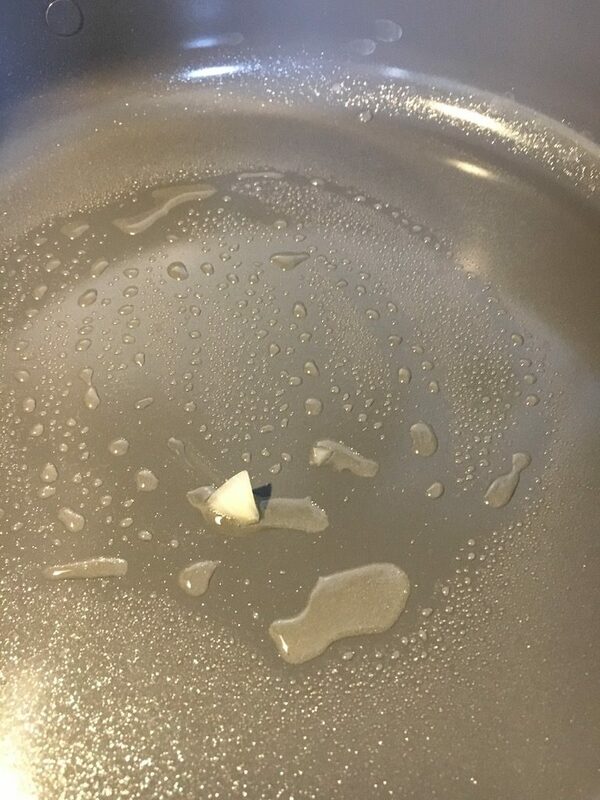 Now, while you’re dealing with the pepper, the tell-tale piece of onion will heat up with the pan and bubble and sizzle, giving you aural indication that the pan is ready. Genius! 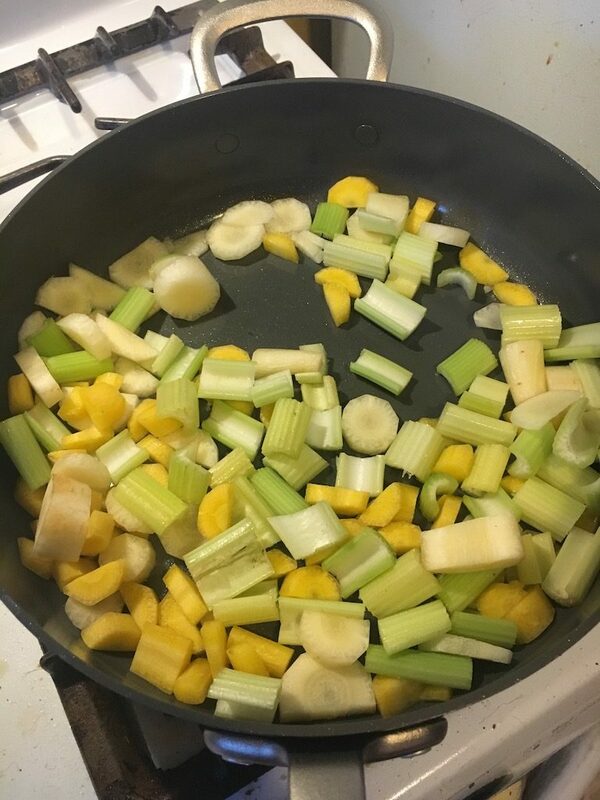 When the pan says, “Go!”, throw in the rest of your chopped allium and give it a swirl with your favorite wooden spoon (also a topic for another post) so that each piece gets shiny. Sprinkle on about a teaspoon of cumin (authoring recipes will be difficult for me; I don’t measure spices. Ever.) and give it another stir. Let the onions hang out and get a little softer, for about five minutes. Once the peppers are sufficiently steamed, they’re ready for “processing”. Some folks say you should scrape the charred bits off with the edge of a spoon or the dull side of a knife blade, but I find that arduous and think running warmish water over the pepper gets it ready more quickly (did I mention patience up there?). Compost the seeds, veins, and stem. Slice the pepper longways and chop to a similar size as the onion bits. 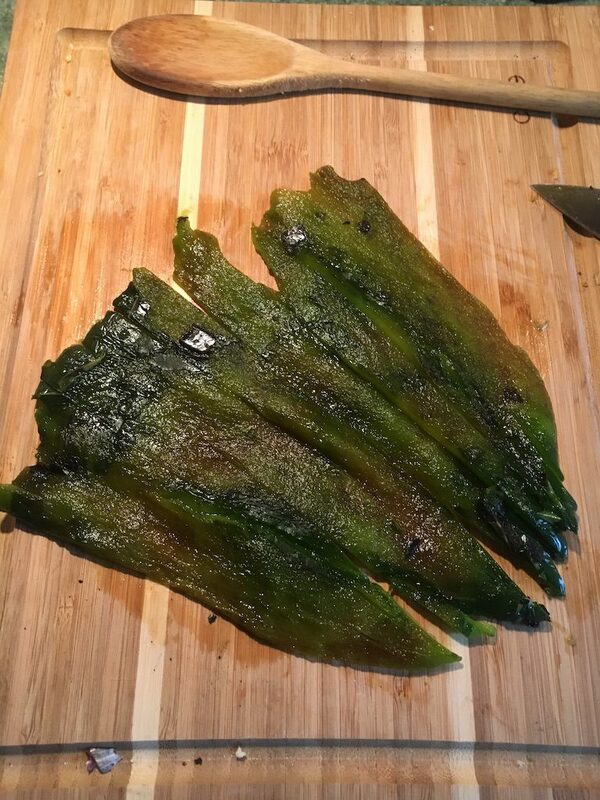 A roasted and skinned poblano. Throw your diced pepper into the pan with the onion and give it a good mix-around and leave on the heat until everything is warmed up (I regret that I do not have a picture of this particular step). In your 2 qt. mixing bowl (this Pampered Chef set is amazing) and with your real fancy French whisk, you want to put some air into five large eggs. In other words, take fifty good whacks at the eggs or until they seem to be fluffy enough. Add the eggs to the pan and … The fella invokes some wizardry at this point, which I’m not quite privy to because I usually find something that needs to be put away or gotten out of the fridge at the EXACT MOMENT the eggs are one minute from being done. An eggy masterpiece waiting to happen. 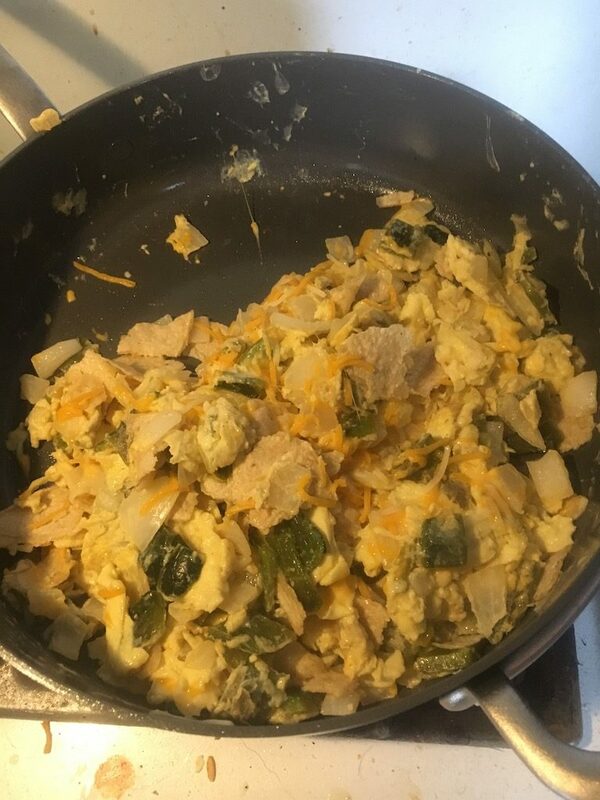 When the eggs look like they are *just about* to set, crumble, rip, and squish up two corn tortillas and add them to the pan along with two handfuls (a heaping cup) of shredded “Mexican blend” cheese. The rate of speed by which these two new ingredients are included should be negotiated between the adder and the egger because stirring and adding should be simultaneous. If it’s just you, then this conversation will be brief. It’s really hard to photograph eggs in a visually pleasing manner. When the cheese is sufficiently melted, it’s time to serve! Dish up more than you think you want because this is amazing. 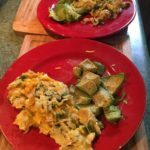 Slice up avocado on the side and nosh with your favorite breakfast beverage. Sunday morning at the breakfast nook. This is a Norwegian gal’s Tex-Mex version of a traditional Spanish breakfast dish (or for whenever really). Roast the poblano over medium heat until charred. Place into a bag to sweat it for 10 minutes. Peel, using your favorite method. Slice and chop. While pepper is sweating, chop up the onion and start a pan over medium heat. Sauté the onion until just soft and add the diced peppers. In a small bowl, whisk the eggs until fluffy. 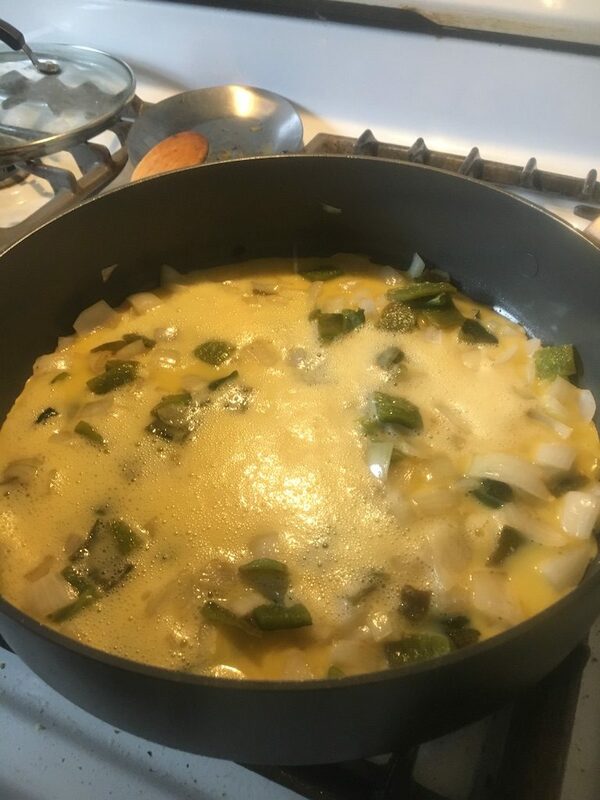 When the peppers and onions are hot, add eggs and slowly mix together; scraping the eggs from the sides and bottom of the pan, using a folding-stir method. When eggs look nearly set, add the crumbled tortillas and 1 cup of the cheese and continue folding to mix everything together. Put the rest of the grated cheese on top and throw a lid on the pan for about 3 minutes. Scoop onto plates and serve with sliced avocado! I use the n+1 theory with garlic cloves. I eyeball chopped onions and grated cheese, but I weigh pasta. I have too many kitchen gadgets, but the Zojirushi rice cooker is probably my favorite.